Every time a police officer puts on their uniform, they are taking a big, but accepted, risk that puts their livelihood in danger. Every time said officer makes it to their End of Watch, or shift, that is a thing to be thankful for. 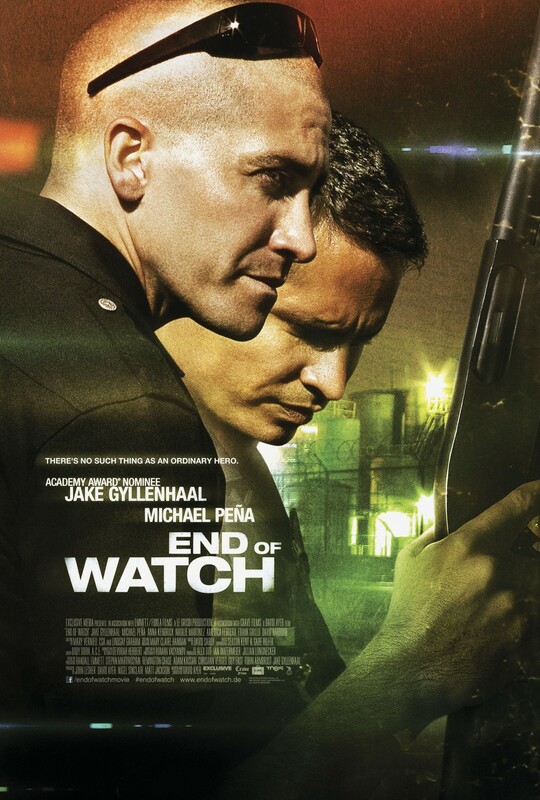 Officers and best friends Mike Zavala (Michael Pena), and Brian Taylor (Jake Gyllenhaal), make a strong and morally sound tandem in the Newton division of the Los Angeles Police Department. Their unbreakable bond for one another is the natural result of so much shared time in the squad car, locker room, crime incidents, and more. To fulfill an assignment for film class, Brian decides to film their daily grind through camcorder and small cameras attached to their uniforms, making for unique point-of-views. 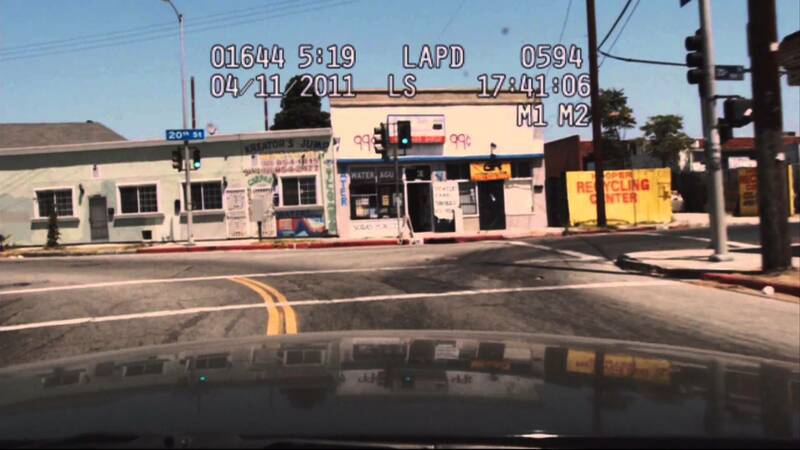 While going through common disturbances, gang matters and house fires, a routine car stop and big-time arrest by the two ends up putting them on a treacherous road that stretches well beyond the unfriendly criminal scum of Los Angeles. Recently, one of my favorite websites in Grantland published a piece about a month ago written by Brian Curtis regarding what “gritty” really means. The effort to define gritty is more from a sports standpoint, but still, the article got yours truly thinking: What is “gritty” as it pertains to a film? Sometimes the word is thrown around so much, and I’m probably guilty of it just as much as anyone, that it loses its impact. Not every film that features gritty subject matter is automatically a gritty film. Most definitions of the word involve a descriptor of unflinching yet grounded realism and toughness. Regardless, whatever gritty means, End of Watch is undeniably it. Immediately from the opening monologue delivered by Jake Gyllenhaal’s character to accompany a chase sequence, the movie wastes absolutely no time in getting the audience into this dangerous world and setting by seeing the action through the eyes of a cop—literally. This is the first of many unique camera angles director/writer David Ayer (Fury, Street Kings, writer of Training Day) decides to make use of. The storyline reason (somewhat flimsy) that Brian gives about recording this for school gives Ayer free reign to do whatever he pleases with the lens. Sure, it is the handheld style that is often derided, but it is employed quite well here save for a few scenes, and does break down the barrier between the audience and the movie. Is it needed? Maybe, maybe not. About the only real issue that can be had with the style is that Ayer never completely commits 100% to it. For about 98% of the film he does, but a few moments exist (and confirmed in the director’s commentary) where instead of being hooked into the realism of what is being shown, yours truly was left wondering who exactly was holding/manipulating the camera, as it looked too traditionally shot for something so gritty. This does take the attention away from the events in End of Watch, but only ever so briefly because it is so rare in occurrence. No matter how this is shot, the performances and superb chemistry of the leads are what drive it. Jake Gyllenhaal and Michael Pena absolutely immerse themselves as officers Taylor and Zavala. The months of training and field observation pay off amazingly. So many people play cops and don the uniform in movies but Gyllenhaal and Pena may be some of the few, if only two, who absolutely give off the feeling like they could go into the force, hit the streets, and make them a safer place. So natural together they are that is is hard to believe that it apparently took some time for the actors to get a feel for each other. They definitely walk the walk and talk the talk as officers, with a major emphasis on the latter. Much detail is found out about this duo in conversations (mostly improvised) that occur in the police cruiser. Some are about nothing, others are about serious matters, but all serve to build two well-rounded characters that feel extraordinarily real, which gives the film’s events more high stakes. Taylor and Zavala are two righteous and gifted cops with a lot of bravery, knowledge, and street smarts, but Ayer does a great job at injecting every scenario the team comes across with a sense of unease. For as skillful as these guys are, there is always the idea that something can go horrifically wrong. They aren’t superheroes, just individuals who make a living in a tough profession. The rest of the cast does provide strong backup though. Frank Grillo is always a strong presence in just about anything he finds his way in. America Ferrera and Cody Horn are the female equivalent of Zavala and Taylor, just with way less attention given. Both are still convincing. After the well-recognized praise of the Jake and Michael, the best work may be turned in by those who serve as their better halves in the film in Anna Kendrick and Natalie Martinez. They both play absolutely critical parts that give End of Watch another level of emotion, in spite of their limited screentime. Out of the whole cast, the only performers that come off as ungrounded are those who portray the main antagonists. While possibly over-the-top, if Ayer’s sole goal was for them to be repulsive, he, and they, succeeded. End of Watch is something that sticks in the mind long after the credits roll. Or at least it is sticking in mine. Not because it is deep or profound, but because it is so effective, and gritty of course, at showing what many have verified is an accurate representation of the everyday life of officers. Just hearing the word police conjures a lot of negative connotations in this current day and age, but this film shows that they are just people who decide to protect the prey from the predators. People who, as Taylor states at the beginning, bleed, think, love, and can be killed, like you and I. Photo credits go to impawards.com, imfdb,com, and youtube.com. I only saw this a few months ago and I regret not seeing it sooner! The action was intense and the leads (both male and female) were fantastic and all had great chemistry with each other. Great review, Jackson. Same man, I love cop movies and Jake Gyllenhaal, and I just got around to seeing it. It was in theaters when I was in college, and I never had time to watch films in the theater in college. Still thinking about it. Man, this really left its mark on me.